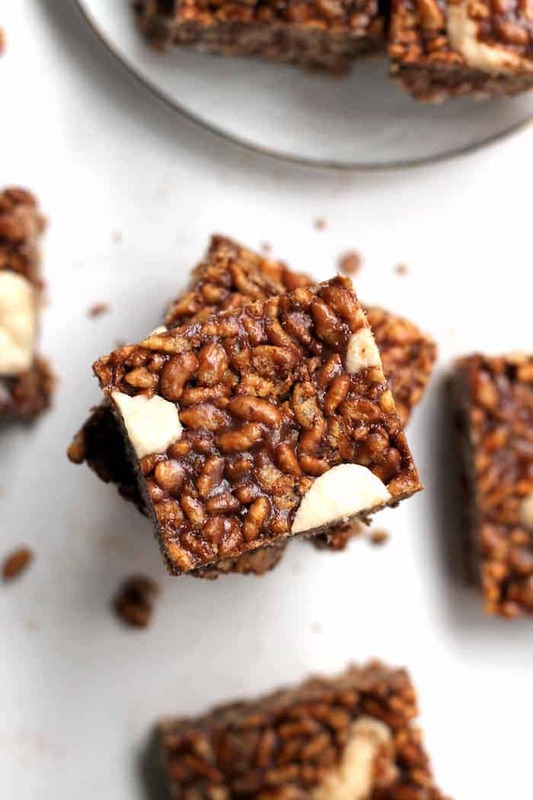 The most deliciously chewy Healthy Peppermint Chocolate Rice Krispie Treats made with whole food ingredients, perfect for the holidays! Vegan and gluten-free. My heart skips a beat when I think back to the first time I laid mouth on these dream boats. I’ve been wanting to make homemade rice krispie treats FOR.EV.ERRRRRRR. I got to personally taste test Arman’s version multiple times and it was love at first bite. You know why I haven’t made them until this very moment? 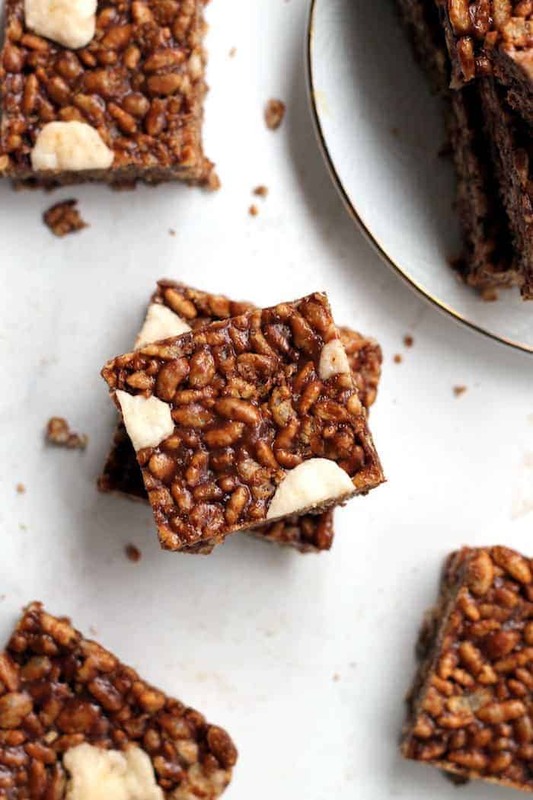 Because I never had brown rice syrup on hand and when it comes to healthy homemade rice krispie treats, brown rice syrup + nut butter is key in lieu of butter and marshmallows. I tell you no lie! This one is different, I swear! I’d loop it into the same family as nutritional yeast and tahini—both staples you may not think to use that often but once you have them around, you can’t seem to put ’em down. I’ve heard that honey maaaaay work, but I haven’t tried it. I don’t think maple syrup would be sticky enough.This stuff is really, really sticky. It lends chewiness to these luscious lovelies that can’t be achieved by other liquid sweeteners. It’s also slightly less sweet. Cool beans! What’s truly rad about this recipe is that it’s just six ingredients and it’s suuuuuuper adaptable. For example, if mint isn’t your jam, leave out the peppermint extract. I’m already dreaming of a million other flavor variations, like s’mores! German chocolate cake! Peanut butter and jelly! Hummus and hot sauce! The marshmallows add another level of classic rice krispie treat-ness if you will, but they’re not essential. If you do so choose to go all out with the ‘mallows, I recommend these all natural vanilla minis. The ingredient profile is a wee bit better than the traditional ones. 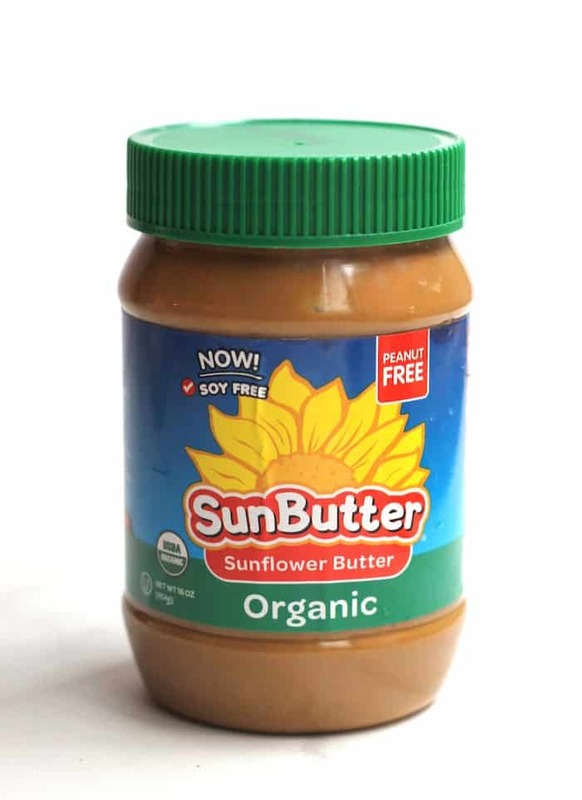 Okay so….SUNBUTTER! Zee seed butter from the sun gods, AKA sunflower seeds. Have you had it? It’s dreamy for kiddos since peanut allergies are everywhere these days and it tastes fairly similar to PB. It has more of a natural sweetness that I love and is free of the top eight allergens. I typically use it as a topper for toast, apples, and bananas, but recently it’s been my buttah of choice in baking. I used Organic SunButter in this recipe, but any variety will do. P.S. If you’re on the hunt for dairy-free chocolate chips, Trader Joe’s has them for super cheap. As far as the base goes, I used this crispy brown rice cereal. Whole Foods has a good house version of the cereal as well. Now is it weird that I can’t stop eating these alongside a mug o’ steamy hot cocoa? Is that chocolate overkill? Yeah, right. As if that’s even a thing! 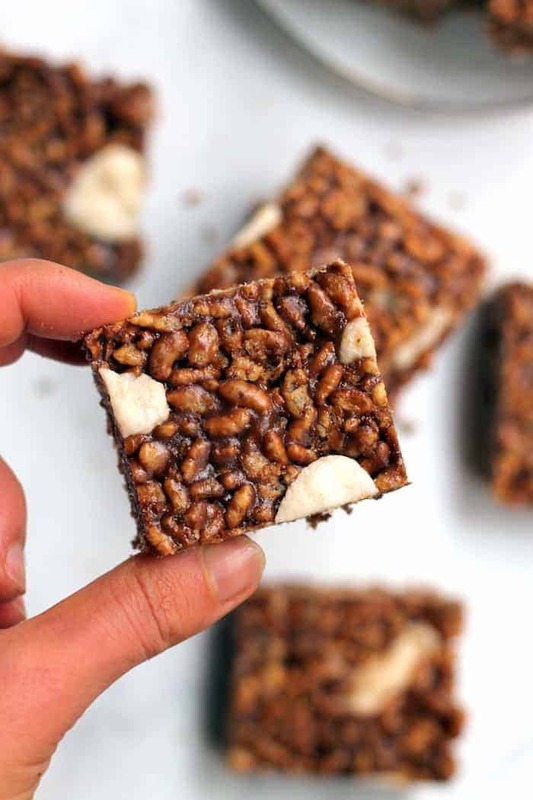 The most deliciously chewy Peppermint Chocolate Rice Krispie Treats made with whole food ingredients, perfect for the holidays! Vegan and gluten-free. Line a 9-inch square baking dish with parchment or wax paper. Set aside. Place cereal in a large mixing bowl. Set aside. Place brown rice syrup in a small saucepan over medium heat. Bring to a boil and let it boil for about a minute (this helps the treats stick together). Remove from heat and stir in SunButter, chocolate chips, and peppermint extract (I like to use a wooden spoon). Pour the liquid mixture over cereal, stirring to coat everything. Fold in 1/2 cup marshmallows. Press the mixture very firmly and tightly into the prepared pan (I use a wooden spoon sprayed with cooking spray). Press remaining 1/2 cup marshmallows into bars. Allow the bars to cool for at least an hour before slicing. You can refrigerate or freeze to speed up cooling. This post is sponsored by SunButter. Thanks for supporting the brands that make Hummusapien possible! These look amazing Alexis!! And seriously…they could build skyscrapers with brown rice syrup. That shiz wouldn’t move an inch. Chocolate and peppermint is the combo of my dreams! Now all I need is some brown rice syrup and I’m good to go, hopefully I find it for 4 bucks too! I’m a sucker for anything with sunbutter, so this looks heavenly! Love the crunch! I made these yesterday; I had to substitute brown rice for white rice but otherwise used recipe as stated. 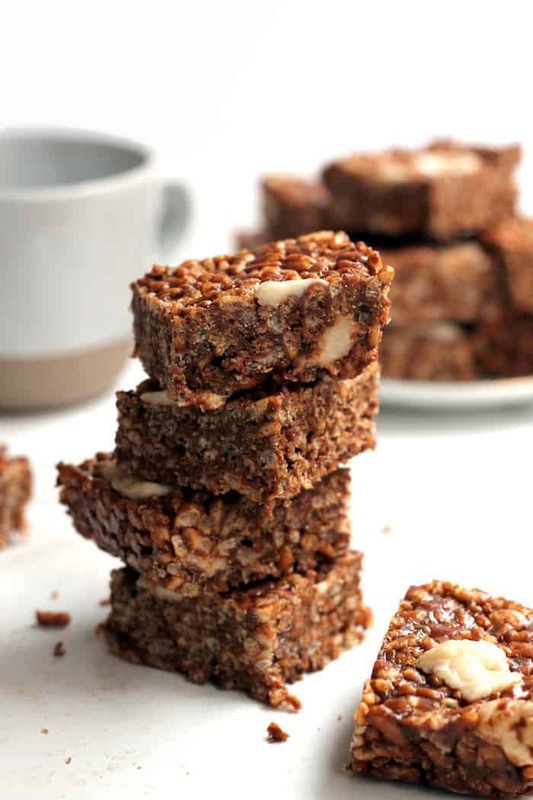 These are delicious and easy to make. Thanks for sharing the recipe. Do you have a breakdown of nutrients and calories by any chance?